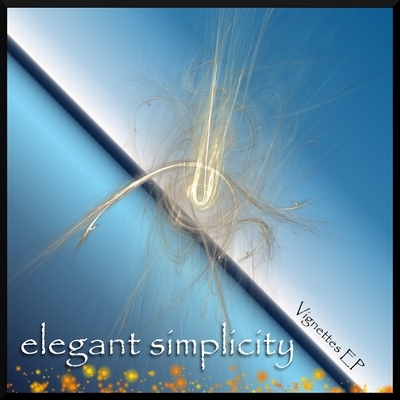 The Vignettes EP by Elegant Simplicity is a collection of 5 songs, thematically linked – stylistically similar – but different to each other! The first track One Tiny Moment of Joy has skittish percussion and a synth solo that fair zips along before an unexpected acoustic guitar solo with a very Pink Floyd like progression! The second song Scheming Dreaming, if it were a wine, would be called a cheeky little number! Featuring a prominent mellotron and bass pedals, together with some random percussion and a delightful little synth melody, this is sure to please. Mood #9 is a totally acoustic piece, featuring just guitar, rhodes, flute and mellotron. Nice guitar solo, too. Summer Nocturne is designed to invoke the feelings of a summer day and is based around a melodic electric guitar part together with some sequenced bass pedals. Very lazy, languid song. The final tune, Winter Nocturne, is just that: the spirit of winter, evoked over two distinct movements. The first one is all flute and moody melloton and the second one is an electric guitar melody playing in tandem to the sounds of an open fire. Composed, arranged, performed, produced and engineered by Steven McCabe using acoustic and electric guitars, an assortment of synthesisers, percussion and many late nights . . . . It was originally recorded at various times between 15/03/2009 and 27/08/2009 at Propinquity Studios, Cheshire, UK. Sleeve design and layout by Steven McCabe.